It doesn't get much better than this. 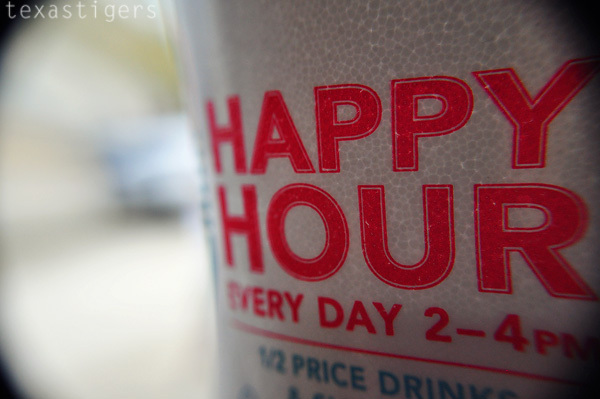 Happy hour at Sonic, two happy (and well!) 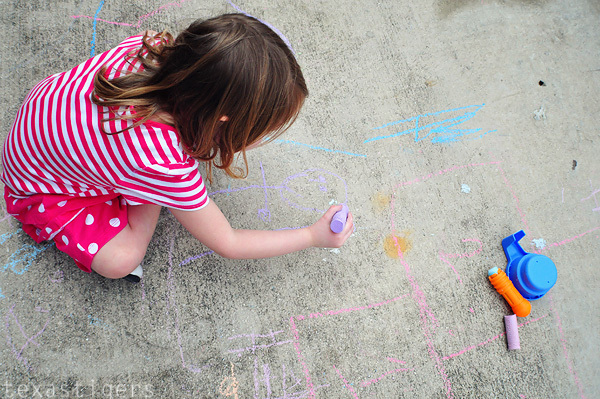 kids, beautiful weather and a box of brand new sidewalk chalk. Love amazon.com - I found a deal on an inexpensive wide-angle/macro attachment for my camera. Being that I didn't pay much for it and the reviews were pretty good I figured I couldn't go wrong with something new to play with. 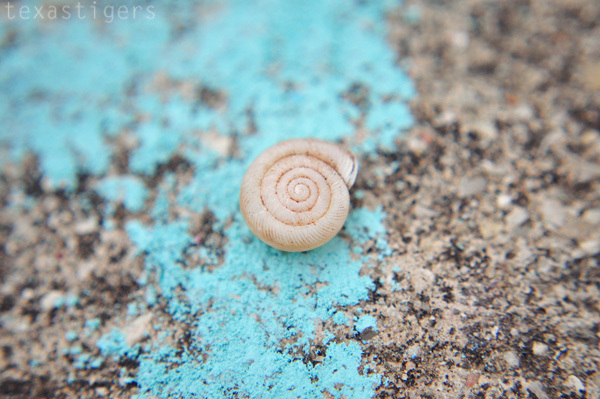 Abby was searching for snail with a shell in the yard and found this tiny shell to show me. Abby went to town with the chalk - she drew our little family. 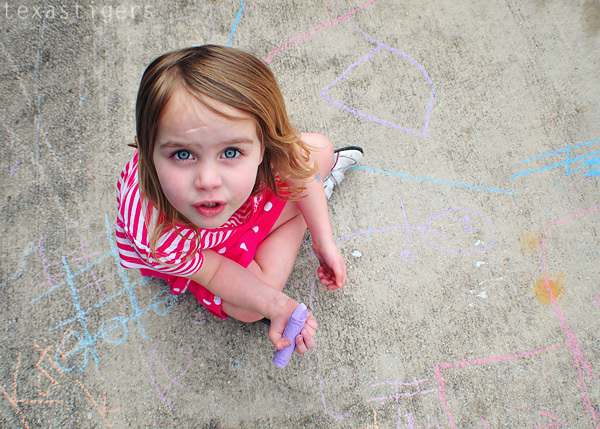 Her favorite thing and almost the first thing we have to draw when we have chalk out though is a hopscotch to play. Over this past weekend Gigi was in town to stay with Abby while Micah and I were out of town. Abby and Gigi played lots of tick-tack-toe so Abby wanted to play more and we played a couple rounds on the driveway. That is until I had to go turn around the plasma car Micah was scooting around on and Abby played a whole game without me and told me she won before I even had a chance to make a move! Whoops! 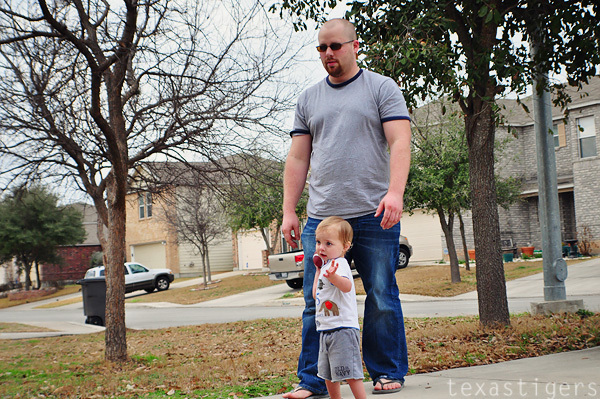 Daddy tried to teach Micah the right way to throw a football. He got it right a couple times but he also threw it sideways quite a few times. That's okay - I'm planning on him playing baseball (preferably for LSU) anyway. I'd rather not have to worry about him being tackled. Ha! It looked a whole lot like fall this afternoon. The wind and rain that came through a couple days ago left a bunch of leaves in our yard. 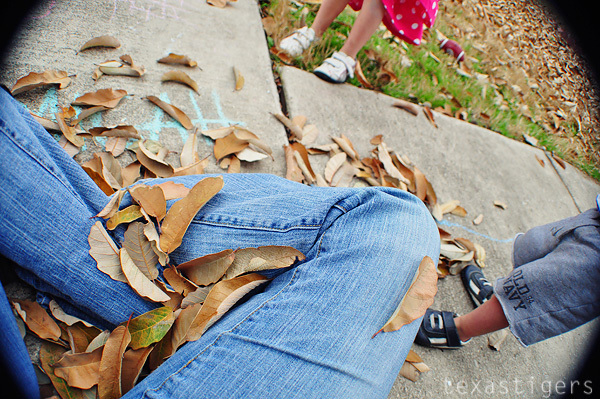 My silly girl decided they should all be in my lap and of course the little bit does just about everything sister does so I ended up with a lap full of leaves. It's hard to have a bad afternoon when we can get outside and play. It's been a while with sick kids and some very cold weather so it's nice to get back outside. It's especially nice that the little ones are feeling better. Micah still was a little clingy and wanted extra mommy cuddles but I can't blame him because I had to wake him from his nap to pick up Abby from school and I think he could have slept longer if we didn't have to leave.